Did you actually think this day would come? We are now a few short days until the Oct 1, 2015 ICD-10-CM compliance date. 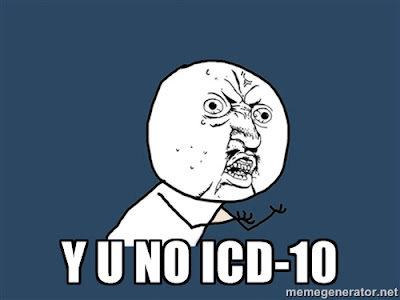 Starting Oct 1st, we, the medical community, have a hard stop and an immediate switch over from ICD-9-CM to ICD-10-CM. Yikes! As many of you know, ICD is short of International Statistical Classification of Diseases and Related Health Problems. What an acronym! ICD-10 is a medical classification list by the World Health Organization (WHO) and is now in the 10th revision. We are going from 13,000 codes in ICD-9 to 68,000 codes in ICD-10. Double yikes! One of the main drivers for ICD-10 is the ability to be more granular and specific with the diagnosis and to more clearly convey the conditions being treated. In addition, with ICD-9, we have run out of the ability to create new codes and so, the ICD-10 definition will allow us to create an expandable number of codes to support future needs. Many resources exist online to take existing ICD-9 codes and convert them to ICD-10 codes. Google it. However, there didn't seem to be a list of common acupuncture ICD-10 codes that you can print out and place on the wall. So, I created one and hopefully you'll find it useful. This is not meant to be a comprehensive list, but a starting point and reference. The PDF can be downloaded from the link below.